WH Smith has said it is to open Post Office franchises within 70 of its 540 UK High Street stores. The deal will see existing post office outlets relocated to WH Smith stores an average of 250 metres from the original site, the retailer said. 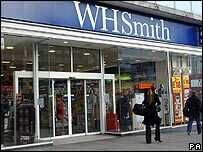 The move, which follows trials in six outlets, will boost WH Smith's annual profits by about £2.5m, the firm said. WH Smith also reported a 7% rise in pre-tax pre-exceptional profits to £59m for the six months to 28 February. However, profits in its High Street shops were down £2m to £51m as sales of CDs and DVDs declined. WH Smith said that there was a "natural fit" between its brand and the post office which had been demonstrated by the pilot scheme. "Customers quickly saw the benefits of the move to WH Smith, including the convenient location in the heart of the town's shopping area, the modern and inviting post office environment, shorter queues, improved service and additional services, such as longer opening hours," the firm said. Post Office Ltd Managing Director, Alan Cook, welcomed the partnership, saying it would help put the post office network "on a sound financial footing, after many years of heavy losses". "The combination of a WH Smith store and a post office branch makes perfect sense for customers and we both believe that it will strengthen our respective businesses," he said. The dip in half-year results in WH Smith's High Street operation were partly due to a 36% drop in sales of in entertainment products such as CDs - as the firm moved away from that sector - and a 4% reduction in demand for stationery. "We remain cautious about consumer spending in our markets, however we are confident in the outcome for the full year," said chief executive Kate Swann. Analyst Richard Hunter of Hargreaves Lansdowne Stockbrokers said that the Post Office tie-up would "undoubtedly provide more foot flow". But he added that while cost-saving measures at the firm were going well, they masked an underlying fall in like-for-like sales in the High Street. Like-for-like sales - which strip out the impact of new store space - for the half-year were down 6% across the WH Smith group. Like-for-like sales were 8% lower at the High Street stores, but the travel business saw a 4% rise. In August last year, WH Smith demerged from its newspaper distribution business Smiths News.